7 To all that be in Rome, beloved of God, called to be saints: Grace to you and peace from God our Father, and the Lord Jesus Christ. 8 First, I thank my God through Jesus Christ for you all, that your faith is spoken of throughout the whole world. 10 Making request, if by any means now at length I might have a prosperous journey by the will of God to come unto you. 12 That is, that I may be comforted together with you by the mutual faith both of you and me. 13 Now I would not have you ignorant, brethren, that oftentimes I purposed to come unto you, (but was let hitherto,) that I might have some fruit among you also, even as among other Gentiles. 14 I am debtor both to the Greeks, and to the Barbarians; both to the wise, and to the unwise. 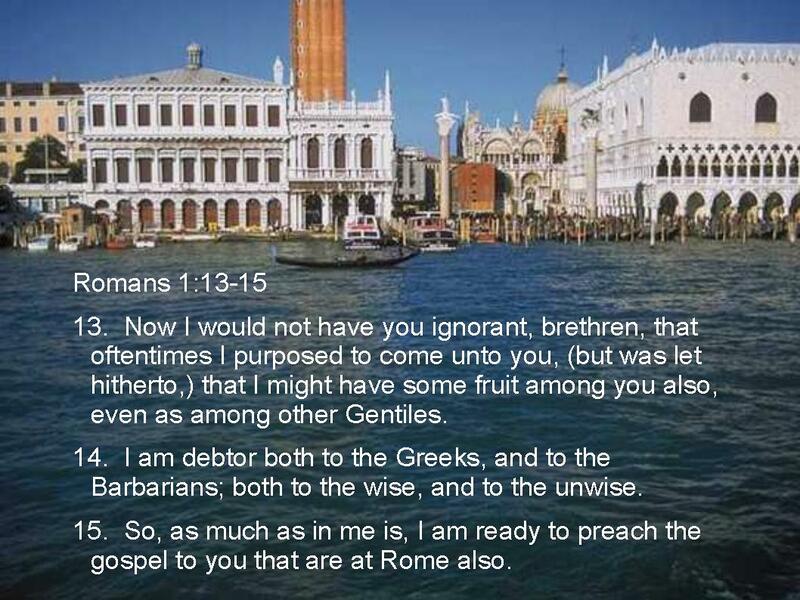 15 So, as much as in me is, I am ready to preach the gospel to you that are at Rome also. 16 For I am not ashamed of the gospel of Christ: for it is the power of God unto salvation to every one that believeth; to the Jew first, and also to the Greek. 17 For therein is the righteousness of God revealed from faith to faith: as it is written, The just shall live by faith. Vs. 1 – Paul is serving Jesus Christ as he is writing this extremely important book of Romans. This book will give us the gospel, or “good news”, from God. Vs. 2 – This gospel was promised in the Old Testament Holy Scriptures by the Old Testament Prophets. A great example is from the Old Testament prophet Isaiah. But He was wounded for our transgressions, He was bruised for our iniquities: the chastisement of our peace was upon Him; and with His stripes we are healed. All we like sheep have gone astray; we have turned every one to his own way; and the LORD hath laid on Him the iniquity of us all. Vs. 3&4 – The gospel is all about Jesus who is the descendant, the seed, of David. This is very important because God made an important promise to David in the Old Testament. And when thy days be fulfilled, and thou shalt sleep with thy fathers, I will set up thy seed after thee, which shall proceed out of thy bowels, and I will establish his kingdom. He shall build an house for my name, and I will stablish the throne of his kingdom for ever. God had promised David that his son’s kingdom would be established forever. Solomon, David’s son, was the next king of Israel. Jesus being Solomon’s descendant was the rightful heir to the throne. Jesus is the King that will reign forever!! Jesus was shown to be the Son of God, according to the Holy Spirit, by being raised from the dead. Vs. 5 The apostle Paul needed God’s grace. Everyone does! God granted Paul the grace Paul needed and called him to be an apostle to preach faith in Jesus Christ to all nations. Vs. 6-7 The Christians at Rome (to whom Paul was writing) were called by God to be saints, and Paul desired for God’s grace and peace to be applied to them as well. Vs. 8 Amazingly, these Roman Christians had such a strong faith in Jesus Christ that the whole world was aware of it. According to Matthew Henry’s commentary these Roman Christians had been banished from Rome but had now apparently returned. Their reputation had spread throughout the entire Roman Empire which controlled most of the known world at that time. Vs. 9-12 Paul was longing and praying to God that he might come to these Christians in Rome to help establish them in their faith. Paul desired for these Romans to have the same, mutual faith in Jesus that he had. God desires for all Christians to be established by their understanding of their salvation by faith in Jesus Christ. 1 Corinthians 15:1-2 Moreover, brethren, I declare unto you the gospel which I preached unto you, which also ye have received, and wherein ye stand; By which also ye are saved, if ye keep in memory what I preached unto you, unless ye have believed in vain. Yes, we need to remember how we are saved, and we do not want to believe in vain. Vs. 13-15 He had tried several times to go to Rome but had been restrained (let hitherto) so far. However, he desired to preach the gospel in Rome like he preached everywhere else. Most of the Roman empire was characterized by Greek culture. The barbarians were those people who were not a part of Greek culture. Paul felt that he owed everyone the preaching of the gospel, whether they were cultured or not, and whether they were wise or not. I am glad that the gospel is not just for smart people or wealthy people or certain kinds of people. It is for ALL people! Vs. 16-17 Paul was not ashamed to preach the gospel. In fact he gives the gospel in detail in this book of Romans. This gospel will show us the righteousness of God. No matter what your beliefs are, you will be able to see God’s righteousness truly revealed through this book of Romans as the gospel is laid out. Do you want to live with God forever or be condemned by God forever? The gospel, the good news, is that you can live forever with God. This will be decided for you by what you believe. “It is written” in the Old Testament book of Habakkuk that “the just shall live by his faith.”(Habakkuk 2:4) This is what the apostle Paul is quoting in verse 17. This gospel was first presented to the Jews by Jesus Christ himself. The gospel is now presented to both Jews and Gentiles(everyone else). Finally, this gospel will keep you from being condemned by God. It will save anyone who believes in it and thus it brings salvation! I encourage you to read the book of Romans. It shows that Jesus, God’s Son has died for the wrongdoings of every person, including you, in the world. It shows that Jesus rose from the dead and He promises to raise anyone who is trusting in Him from the dead in the future. It shows that God loves us and desires for us to be counted as being righteous people. We will share this in detail as we advance through Romans! Grace and peace be to you!